A number of marine worms are eaten readily by many saltwater species. Some fish feed extensively on worms; other don't normally frequent areas where worms are found but will grab them without hesitation. Sea bass, striped bass, flounder, halibut, blackfish, weakfish, sea trout, and a host of saltwater panfish species will eat worms. Bloodworms and sandworms are the two most common types of marine worms used by fishermen. Bloodworms average about 6 or 7 inches long and have a smooth, pinkish or reddish skin with short appendages along the sides. Its suckerlike mouth, which can extend and retract, holds two pairs of small, yet sharp, curved pincers. They will latch on to your finger painfully if you're not carefulalways hold a bloodworm firmly just behind the mouth. And make sure you know at which end the mouth is. 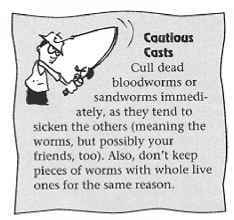 Cut a bloodworm in half and you'll discover why they're called bloodworms. Most sandworms are nine to ten inches long. They're a reddish-tan color with a green or blue sheen and have numerous tentacle-like appendages along their flanks, and have a slightly flattened body. Sandworms also have retractable pincers (only one pair) and also can inflict a nasty bite; these should be held just behind the head as well. 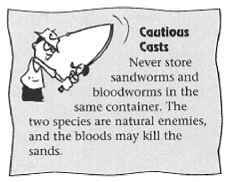 Both worms are found along the Atlantic coast, with sandworms from Long Island north and bloodworms from the Carolinas north. They inhabit flats, which are areas covered with water only at high tide, and burrow in the mud under stones and among seaweeds, with the sandworms burrowing deeper than the bloodworms. Both can be obtained by digging, raking, or by searching at night with a flashlight when they leave their burrows; the process is much like looking for night crawlers. While some fishermen obtain their own worms, the majority purchase them at local bait shops, where the price varies widely according to availability and season (most are collected in Maine and shipped south). They are usually packed in seaweed, must be kept cold, and out of direct sunlight. Bloodworms have tougher skins than sandworms, and stay on the hook longer. They're also a bit hardier and tend to cost more. But both work well. worm's body until just the hook shank (from eye to beginning of bend) is covered. For smaller species, a half, third, or even quarter of the worm, threaded on the hook from the eye to the point, is enough. A sandworm (shown) or a bloodworm makes a good bait for many saltwater fish. Use part of the worm when fishing for smaller species. 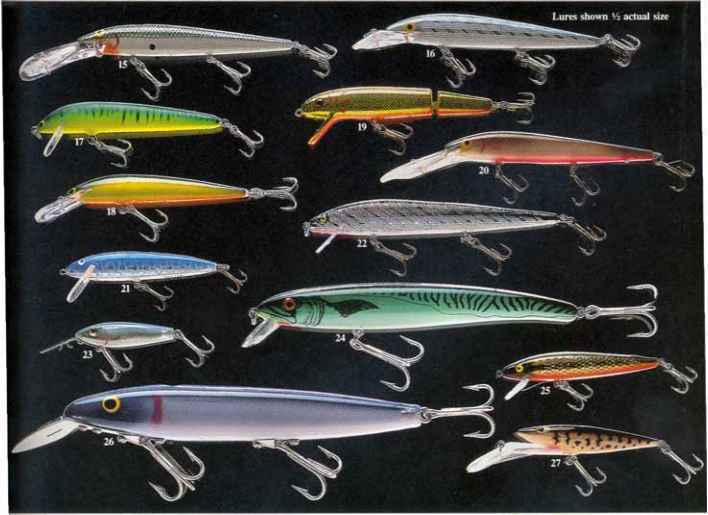 The squid is one of the most common saltwater baits. Its strong odor, bright-white flesh, and sturdy composition make it a favorite of both fish and fishermen. Squid are typically sold frozen at bait shops, or refrigerated at grocery stores under the name calamari. While offshore fishermen sometimes troll large, whole squid for tuna and billfish, most squid is fished in strips by anglers fishing inshore and inland waters. To cut a squid into strips, defrost it in a bucket of seawater. Pull the head and tentacles off; save the latter if you'll fish for small species such as croaker. Peel the skin from the remaining tube, slice from bottom to top with a knife or scissors, rinse out the ink and remove any remaining cartilage, leaving you with a flat white sheet of squid meat. Use knife or scissors to cut long, tapered strips of meat that come to a point on one end. These pennants wave enticingly in the current or when retrieved. Keep your squid strips cold, preferably in a container with a bit of seawater. Don't let the squid strips sit in fresh water, as they'll turn mushy. 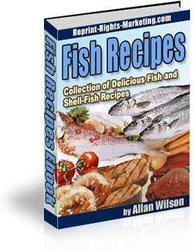 Fish such squid strips plain on a hook, as a sweetener on a jig or other lure, or in tandem with a baitfish. Always put the point of the hook into the base of the wide end, so the rest of it will wiggle and flutter. The additional color and scent of a squid strip will often trigger fish into striking a bait or lure that they'd otherwise leave alone.